We don’t know enough about student homelessness in Canada and in this guest blog Dr. Eric Weissman explores the research he’s done on the issue and how much more work needs to happen to properly address the problem. He will be presenting at our National Conference on Ending Homelessness next week. By Dr. Eric Weissman, Ph.D.
Those of us who work in education and in poverty research know from anecdotal information gathered in collaborations with homeless adults and older youth that student homelessness is a taboo subject and likely more wide-spread than we know. It does not take a great leap of faith to imagine that student homelessness occurs at the great expense of individuals’ dreams and hopes, lost productivity in our economies and the cultural wealth of our communities. In Canada to date, we have no idea how big a problem it is, how it is distributed regionally and across other dimensions such as, age, gender and ethnicity; we do not know what it costs us as a nation in terms of the health and social wellbeing of our citizens or the economic and cultural impacts on our communities. In 2014, there were 5,032,000 students in all levels of education in Canada; just over 2 million of these were in Post-Secondary Institutions (Stats. Can. 2016). With the Federal Government’s position on prevention, it is sensible to address student homelessness as a unique lived experience requiring specific supports and interventions. Research done by Housing and Urban Development, the US Department of Education and various US State Department’s of Education, cited in Ilyana Keyohane (COH, 2016) and Weissman (2017) suggests that as many as 1.4 million US students fall under the category of homelessness. These experiences range from being literally unsheltered to couch surfing. Newspapers tend to carry these stories because of the dramatic nature – homeless students? Students failing at courses, unable to find jobs, sleeping in gymnasiums, libraries, stairwells of empty academic buildings, and riding subways all night; each seems to be an almost unbelievable story, except they are frighteningly common. In Canada, there are 2 million Post Secondary students. We do not know how many of them are homeless or at-risk. However, we have anecdotal evidence from staff and students, and from homeless youth we work with, that student homelessness is a hidden but large and costly problem. How big is it? Where does it happen? What are the costs? I undertook a small exploratory survey of students at Red Deer College in 2017 while I was an instructor. 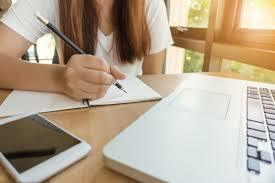 Students enrolled in courses in the humanities and social sciences were asked to freely and anonymously respond to an online survey – approximately 190 responses were gathered from a pool of approximately 1,200 students. 60% earned less than 15,000 CDN/yr., 22% earned 15-24,000 CDN/yr. 43% of respondents had had mental health diagnoses, 23.7% were ongoing (We found this a curious, if not troubling result: it is twice the expected rate. It could mean that students with this experience were more likely to fill out the survey. Again, this is a type of result we would want to refine in our proposed research). Only 2.6% reported current homelessness – responses suggested an additional group homeless by our definition, but that they found it hard to see it that way. 62% said they never hear stories about other students being homeless, but 17% suggested they do hear stories about it. Of those who reported hearing stories, 50% suggested they heard it about 2 or more students. Again, sensitivity to the issue may lead to greater awareness and disclosure. Alarmingly, almost 40% of students suggested they would do anything to find shelter. And this has obvious implications for understanding the criminalization and exploitation of youth. There are an additional 32 questions on the survey that will be analyzed, and once again, the reader is reminded that this survey is preliminary. We are only beginning to understand its implications. However, given that there are approximately 2,000,000 students in post-secondary schools in Canada, if the 2.6% of current homelessness turns out be a universal and valid rate, then 52,000 Canadian students are currently experiencing some kind of homelessness. If the deleterious impact of homelessness suggested in these responses is also universal, then we have a certain moral obligation in addition to numerous practical considerations, to address this issue rapidly. These issues and more in-depth discussion of future research plans will be discussed in my session at next week’s National Conference on Ending Homelessness. In the meantime, any researchers or students interested in participating or contributing ideas can reach me at eric.weissman@unb.ca. “Don’t wait until the end of the day to figure out where you’re sleeping that night. It makes it far more stressful. Try to focus on class the best you can and know that if you stick with it, it will pass. Reach out and let people know the situation that you’re in, even if you’re embarrassed about it because it may not even be your fault. Make sure you’re fed and just keep your head up.” RDC student. Catch Dr. Eric Weissman at the National Conference on Ending Homelessness on Nov. 6 for his session, Research Roundup. This interactive Speed Geeking session will give participants the chance to learn from experts on topics ranging from youth homelessness and the education system to a case study on social network analysis; from outcomes measurement in evaluating services to the role empowerment (identity capital) has on young people transitioning out of homelessness. Participants will spend time at each presentation station and with plenty of time to ask questions at each station. 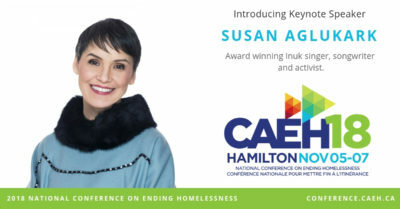 Award-winning Inuk singer, songwriter and activist Susan Aglukark will be one of our keynote speakers at the upcoming National Conference on Ending Homelessness from Nov. 5-7–our biggest one to date! We’ll be live streaming our keynote presentations on Facebook throughout the three days. Don’t miss anything if you follow #CAEH18 on Instagram and Twitter too. We will be posting and sharing experiences live from the conference in Hamilton.